Uvicure Plus II and UV Power Puck II are widely used throughout the global UV industry. With user selectable sample rates, these reliable instruments can be used for fast conveyor lines or slower Lines. UV Data Displayed on One Screen for Up to 4 Bands. 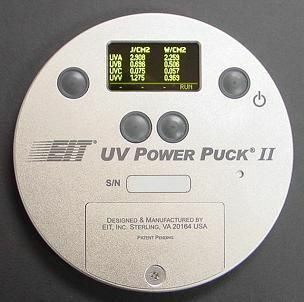 Data is simultaneously collected for up to 4 bands on the UV Power Puck II, then displayed on a single screen in mw/cm2 for quick and easy viewing by the operator.